Written by Thomas F. Remington. Many commentators have noted the parallels between the political regimes of president’s Xi Jinping and Vladimir Putin. Xi’s proposal to remove the two-term constitutional limit for China’s head of state is only the most recent move, signalling that General Secretary Xi wants to abandon the convention of restricting the party leader to two five-year terms. Similarly, on the eve of his next presidential term (the election is March 18), President Putin has already reached the milestone of having remained in power longer than Leonid Brezhnev. Both Xi and Putin have significantly increased military spending and asserted military power globally. Both have tightened political control over the mass and social media, imposed stringent restrictions over the activity of non-state organizations, and increased the state’s control over the economy. Most striking is the growth in the concentration of personal wealth at the very top, among the top 1% of wealth holders. At the same time, in both countries, the bottom half of the wealth-holders in the country has seen a decline in their net personal wealth as a share of total wealth since the world recession of 2009. Income shares at the very top have seen less of a recovery since the crisis, although they have stopped falling. Incomes at the bottom have risen slightly since the crisis. Inequality in both countries is linked to both economic and political factors. The extraction-based economy of Russia has raised incomes for many employed in the oil and gas sectors. This phenomenon has also driven up incomes in the regions where mineral resources are concentrated. Within those sectors, wage incomes are highly unequal, one reason that the averages are so high. 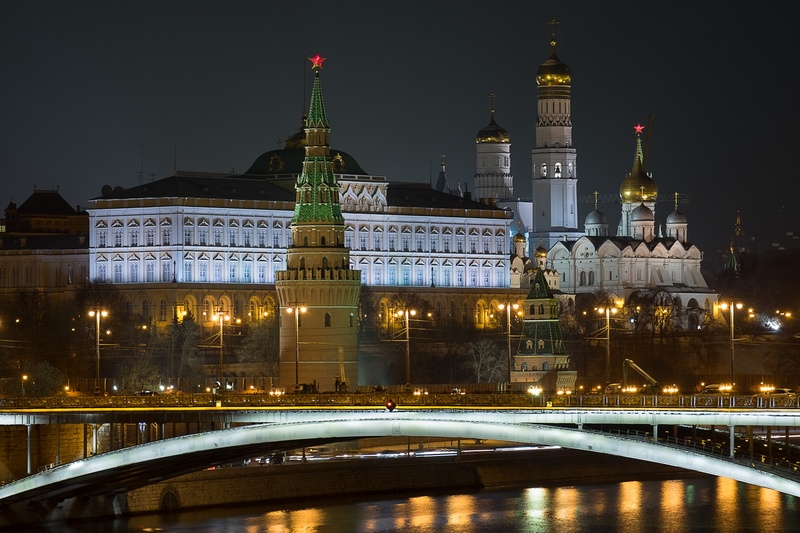 Less commonly noticed, however, is a phenomenon common to the United States as well, the “financialization” of the economies of both Russia and China. Average labour income in Russia in the financial sector now exceeds that of earnings in oil and gas. China too has seen soaring incomes in the financial sector. Wages in the financial sector are now higher on average than in any other sector; moreover, half of all corporate profits are now being realized in the financial sector. What explains these trends? The Piketty team argues that the main reason for rising inequality is growing concentration of private wealth. 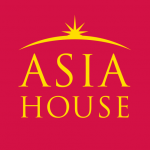 For the post-communist societies such as China and Russia, they argue that it is the privatization of public assets that has produced enormous windfalls for the top-end wealth holders. 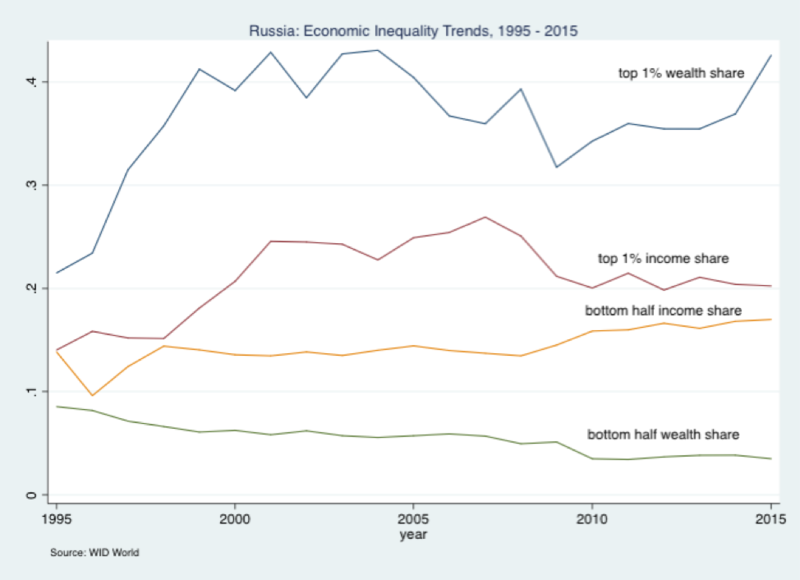 It is not clear, however, that wealth is, in fact, the most important source of income inequality for Russia or China, just as it is not for the United States. Rather, the main source of rising inequality in the three countries lies in the distribution of labour earnings. In part, this is due to the ability of “super-managers” to award themselves extremely high levels of compensation even while the average wages in their companies are stagnant. This is certainly the case in Russia, where enough data on the earnings of the chief executive officers of the top companies are available to make it clear that the ratios of CEO pay to average worker pay in the same companies are even higher than in the United States. The rich in both China and Russia send a huge share of their incomes out of the country and into off-shore accounts as well as real estate, art and other assets held abroad. Indeed, Piketty’s team calculates that Russians hold as much personal wealth in offshore accounts as the total amount of wealth invested in Russia. The Global Wealth Report for 2018 published by Knightfrank calculates that Chinese funds deposited in off-shore accounts rose by $172 billion, or 721%, in the 2014-2017 period, significantly affecting asset markets worldwide. Both countries are now seeing substantial increases in the number of individuals whose net assets total $500 million or more. Knightfrank estimates that the population of ultra-wealthy will more than double in the next five years. In both countries, the ultra-wealthy, like their wealth, are highly mobile: in Russia and the CIS countries, over half of these individuals have a second passport. Therefore, although wealth is accumulating rapidly in the hands of a very small number of people in both countries, much of that wealth represents the conversion of extremely high incomes into wealth, including non-capital assets, often held in untaxed overseas accounts. How do we explain such high-income inequality? I believe we need to draw on the theory of rent-seeking, such as Joseph Stiglitz applies to the United States. Rents are the revenues derived from an asset that is protected from full market competition. Owners of assets go to great lengths to exert influence over policy-makers in order to preserve their rents. They persuade, lobby, and bribe those in power. To be sure, there are legitimate arguments in some cases for preserving rents. However, rents can be generated from a variety of activities that are hard to square with the public interest, such as rules preventing private firms from competing with big state-owned enterprises or sheltering privileged firms, state or private, from bankruptcy (“too big to fail”). These rents are distributed in the form of higher wages to the protected firms and further differentiated as the top managers receive compensation that is hundreds of times higher than that of the average employee in the firm. When such firms are protected by the government, the rents are often shared with government officials. The officials may call on the firms for special contributions to election campaigns, prestige projects, or private spending. This kind of cronyism, or reciprocal sharing of rents, is characteristic of business-government relations in many countries, among them Russia and China. It also applies to the cosy relations between major financial interests in the United States and their supporters in Congress and the executive branch. If rising economic inequality is a problem, what is the solution? It is too easy to say that democratization will stimulate redistributive pressures–there is too much evidence to the contrary. On the other hand, policymakers who fear that inequality can trigger social unrest may act strategically and increase spending on public goods such as education, healthcare, transportation and communications infrastructure, and social insurance, that tend to equalize access to economic opportunity. 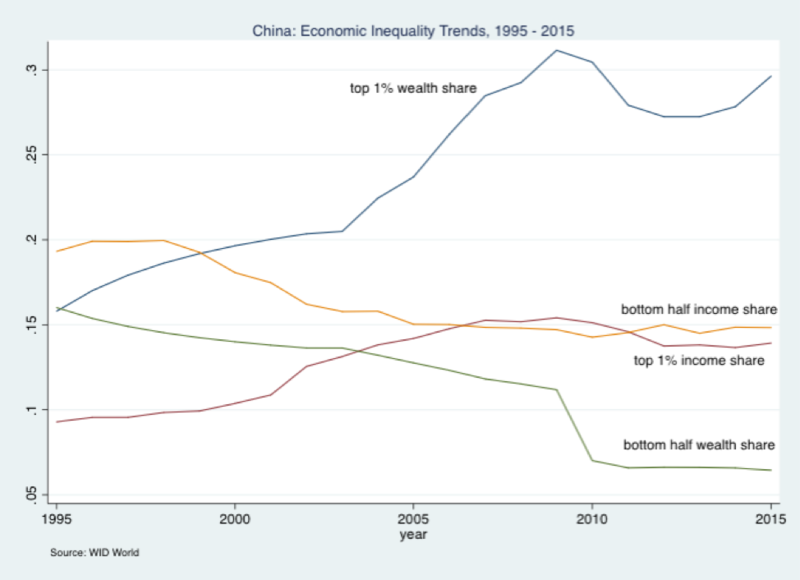 The leaders in both Russia and China periodically signal that they are concerned about excessive inequality, although they frame the problem in terms of poverty rather than the consequences of the concentration of wealth at the top. In his recent address to the Federal Assembly, President Putin declared that the level of poverty was too high and that over the next six years, he intended to cut poverty in half. And, as in the past, he also spoke in favour of developing “a mass, active middle class.” However, he has consistently refused to switch from the flat-rate (13%) individual income tax to a graduated income tax and did not (as he did in the 2011-2012 period) cite inequality itself as a problem. In China, the government has taken a similar tack for the past several years. In early 2013, the State Council issued a statement calling for several reforms aimed at reducing the income gap. These did not have a strongly redistributive flavour, however, rather emphasizing the need to raise low-end incomes through economic growth. The document lacked policy detail. It reflected a tendency to avoid having to resolve redistributive conflicts. Leaders in both countries thus prefer a strategy of inclusive growth to one that pits the power and interests of the wealthy against the broad but unorganized strata at the low end of the distribution. Some scholars in China have referred to this as a policy of “control the two ends, cultivate the middle” (控制两端，培育中间). Such a policy would reduce inequality only if economic growth, in fact, tended to increase the size of the middle class by raising incomes at the bottom faster than incomes at the top. So far, however, the economic growth patterns of both China and Russia, as in the United States, have tended to benefit those at the top far more than those at the bottom. Thomas F. Remington is a Visiting Scholar at Harvard University, Goodrich C. White Professor (Emeritus) of Political Science, Emory University and Senior Research Associate, National Research University – Higher School of Economics, Moscow, Russian Federation. Image Credit: CC by PublicDomainPictures.Net.